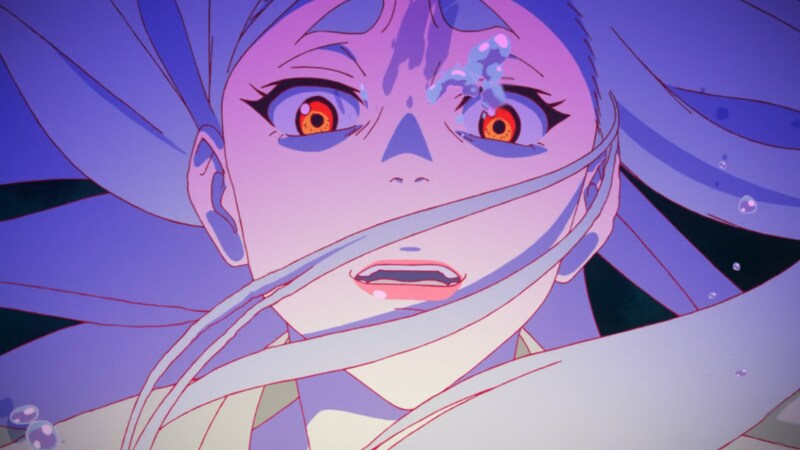 Please enjoy this piece on the new series by Kazuya Tsurumaki, Evangelion‘s assistant director and the mind behind FLCL – titles that I promise I’m not just namedropping to catch your attention, but that are very relevant to his new work. The Dragon Dentist was the opening for studio Khara’s Animator Expo, a fascinating anthology project finally putting their brilliant creators to good use. 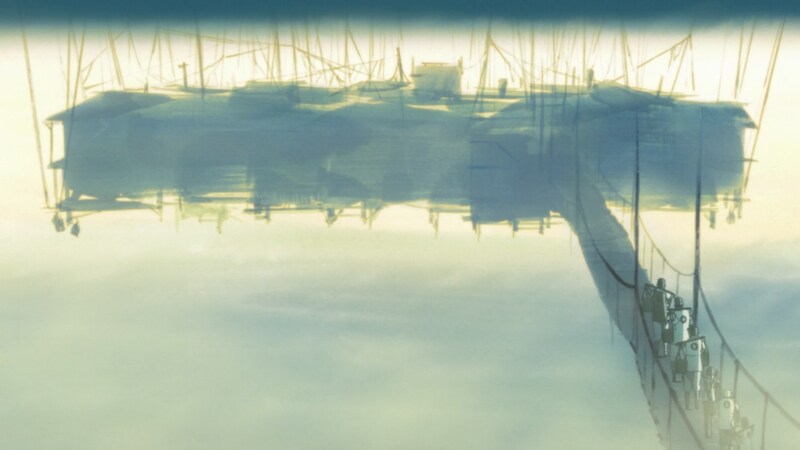 The short film featured a staggering number of talented artists led by Hideaki Anno’s right-hand man Kazuya Tsurumaki, as well as the eccentric novelist who turned out to be one of Animator Expo’s recurring stars Otaro Maijo. It presented a war setting where humans forge pacts with almighty dragons, whose only weakness appears to be bad oral health. Quite the curious way to explore inevitability, fate, death, and our life purposes. 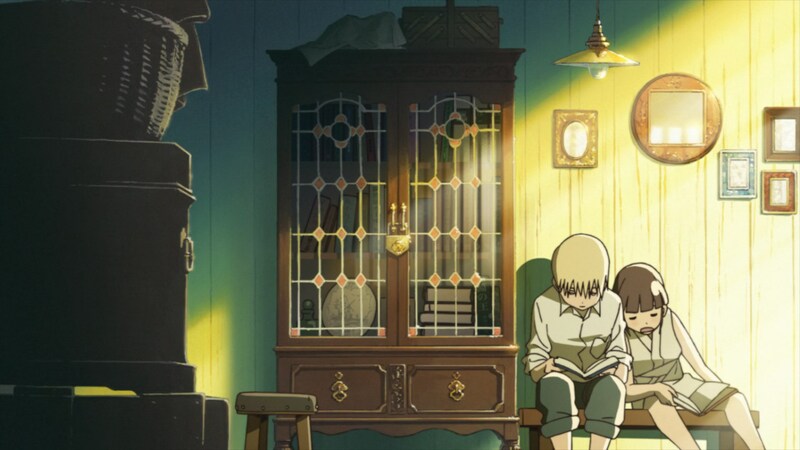 A couple years have passed since its premiere, and now The Dragon Dentist is also spearheading an initiative to turn those 10 minutes long films that sometimes felt like mere pilots into fully fledged productions. It has set new precedent…officially at the very least, since as some Yuri On ICE fans might be aware, Sayo Yamamoto directed a skating Expo short featuring a boy mimicking his idol’s moves – sounds familiar, I’m sure. Either way, this was an exciting development without a doubt. 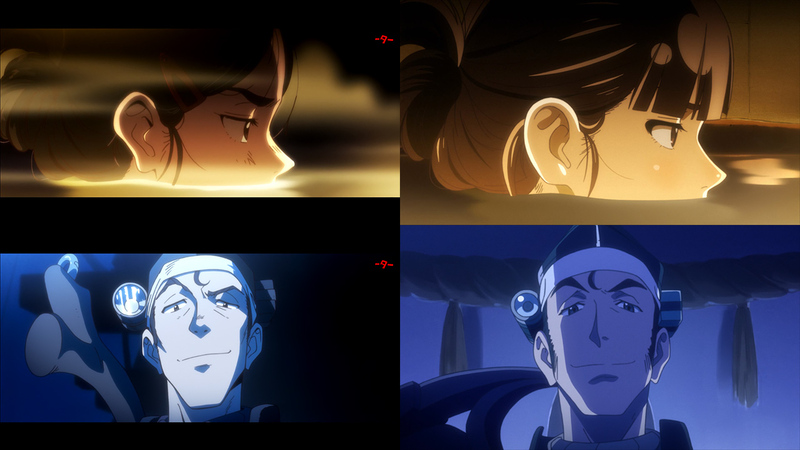 The TV version of The Dragon Dentist takes the form of a sequel of sorts, chronologically placed after the original yet made approachable for new viewers. It immediately makes it obvious that it’s no whimsical addition of new concepts, but rather an exploration of material the staff had always wanted to tackle. A chance to fully realize the world Maijo and Tsurumaki had envisioned to begin with. And considering the single yet fundamental issue I originally had was that it left me too intrigued by a fictional world I could barely scratch the surface of, it couldn’t have been a better choice. But besides its nature, there’s something else that’s quickly apparent: the aesthetic changes. To be more precise, the new character designs. The beloved Yoshimichi Kameda handled the animation models for the short film, but perhaps due to his busy schedule he’s been replaced by Khara’s promising youngster Shuichi Iseki. Halfway through the first episode there’s a quick recap of past events that uses the same layouts and thus serves as a rather fair comparison. And to be honest, I imagine many viewers will consider the loss of Kameda’s strong personality and vigorous lines quite the downgrade, even (especially?) in motion. To some degree I agree as well, though I’m rather fond of Iseki’s cute character art. The influence Yoshiyuki Sadamoto’s designs had on him is immense when it comes to certain characters, whereas some women in the cast are very similar to Iseki’s own work on the highly memetic Me!Me!Me!. If we’re going by points of contention, the usage of 3DCG will also not sit right with everyone. As has been the case with most of Khara’s output, there are many scenes almost entirely lacking any hand drawn elements. 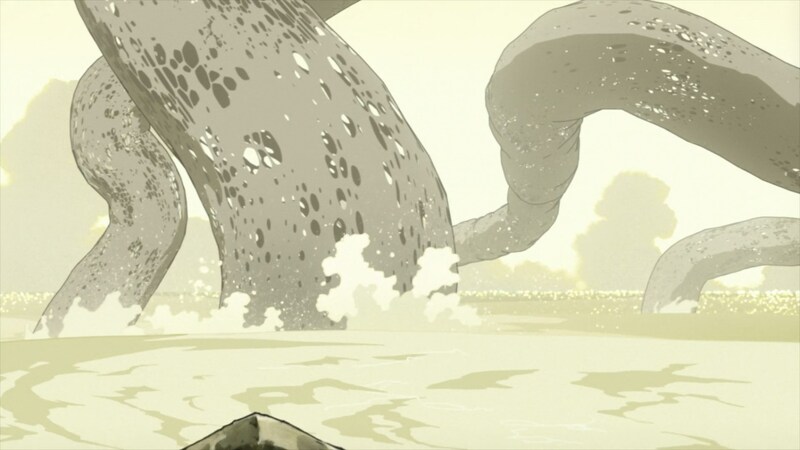 Unrepentant CGi that wants to blend yet not appear 2D-like hijacks The Dragon Dentist for minutes at a time, simultaneously annoying viewers and enabling spectacular setpieces like the hectic camera around its climax. It’s always obvious why they chose to use 3DCG – large mechanical elements like battleships and the dragons themselves that have to appear solid, notoriously annoying scenes to animate like horse riding – but I’ve never believed the audience has to concern themselves with that. I thought the individual sequences were functional on their own and a bit tiresome by accumulation, so surely more traditionally-minded folks will find it exasperating – and that’s perfectly fair! Unlike this write-up so far, which hasn’t been fair at all. There are even more shortcomings I could mention, like the otherwise elegant delivery becoming a bit clumsy when explaining past events, but my intention was to get the negative out of the way early. There are things The Dragon Dentist seems to do poorly. But despite those, and even if there had been many more, I would still adore it. It’s not as if the pieces that compose the series are weak on their own, but this is a clear case of the whole being even greater than the sum of its parts. Tsurumaki’s direction can imbue anything with charisma, and collaborating with a mind as unique as Maijo’s was an explosive cocktail. 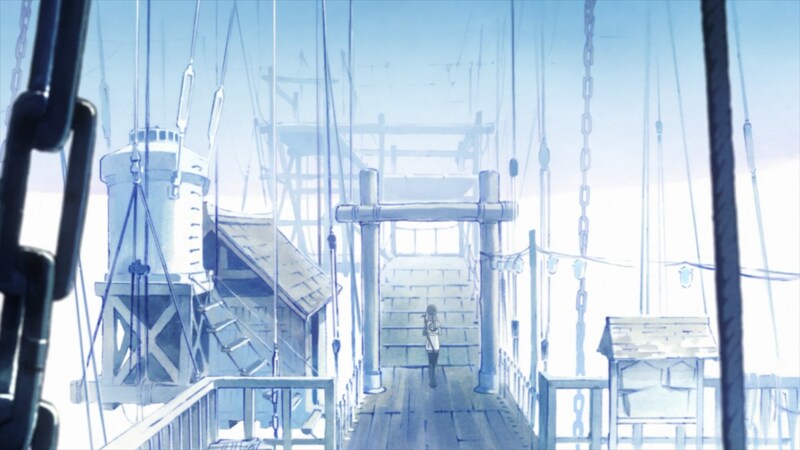 Despite its true appeal being a bit of a vague concept, let’s try to break down what’s so good about The Dragon Dentist. Once again Tsurumaki makes the sheer scale of the dragons into one of this work’s assets; while it doesn’t have the brilliant buildup the original had, perhaps considering that an already spent trick, portraying the colossal size of the dragon when compared to regular people is still an important goal. This is a story about individual powerlessness after all, but also about the contrast between that and puny humans deciding to face something much larger than themselves. The physical world itself is a clear standout as well, as you would expect from Studio Pablo. While Ayaka Fujii isn’t a fully-fledged art director at the company yet, this serves as a solid argument that she might deserve that spot. The backgrounds don’t have the maddening intricacy of Pablo’s best work, but the setting enabled plenty of interesting architecture, and the simple backdrops don’t feel half-baked at all. The color design is also exceptional, easily Akemi Nagao’s best work; the synergy with the backgrounds is immense, but that’s not cheating so much as what is supposed to happen. 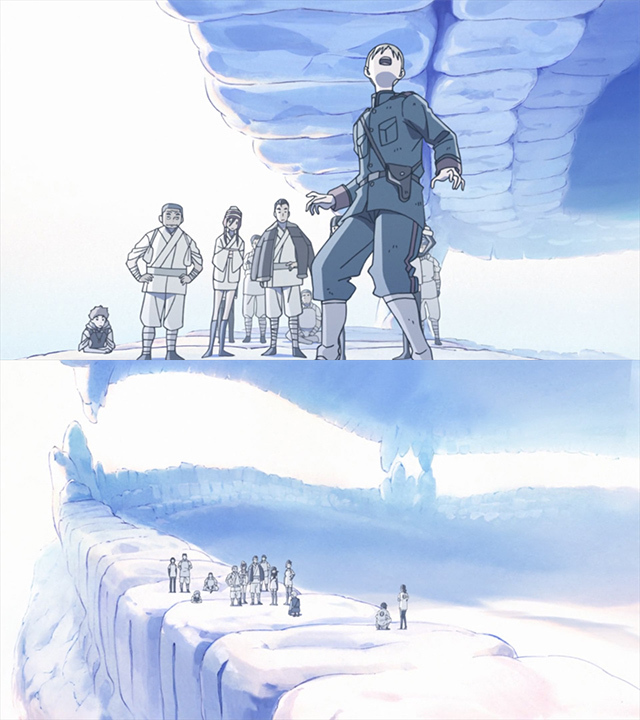 The Dragon Dentist abandons any semblance of realistic lighting, and paints each scene according to its mood. There was no reason to restrict it through a grounded approach considering the nature of this tale. As much as this could have been a story just about ideas though, the staff wanted to make sure it worked on a character level as well. Beautiful montages explicitly advance Nonoko and Bell’s relationship, but it’s the details that sell just how much they grow accustomed to each other; Nonoko has a nasty habit of kicking people in the shin when exasperated, so Bell instinctively retreats his leg after telling her something she won’t like. She holds back this time, but after patching things up later she ends up delivering a final frustrated kick – animated by the one and only Hiroyuki Okiura, as made obvious by Bell’s articulate slow fall and the unmistakable frown on her face. That’s far from the only animation highlight of course, since a veritable tsunami of top animators shook this production to its core. Some personal favorites would be Naoki Kobayashi’s plentiful action cuts, featuring those soft smears that Naruto fans are so familiar with. The most memorable sequence has to be this descent into madness, presumably animated by Toya Oshima due to its clear Shinya Ohira influences. These are but a small selection however, there’s plenty more of good work – thorough character acting of all kinds, effects that show parallels in the fluidity of the dentists’ weapons and their alien foes, surreal morphing…. I often point out that high numbers of animators tend to be a scary sign of rushed work, but general rules don’t quite apply here. This was Khara’s first TV series, an exciting idea that attracted all sorts of skilled artists. And that’s not limited to the animation department, of course. There are 6 storyboarders and about as many directors involved, which is rather ridiculous even considering its length. Studio employees and acquainted creators were equally excited about the prospect of working on this, it seems. And that enthusiasm is no coincidence. Much to the chagrin of Rebuild fans, the creators at Khara only seem to find motivation away from Evangelion at the moment, despite the many reports about the last film being actively in production. Hardly something I could fault them for, even if I didn’t happen to love the projects they’re distracting themselves with. And yet, the more The Dragon Dentist progressed, the more familiar it felt. Developments and aesthetics that I had already experienced. A plan to reunite with your loved one by exploiting god-like entities ends up being the trigger of all events. An apocalyptic world of red. 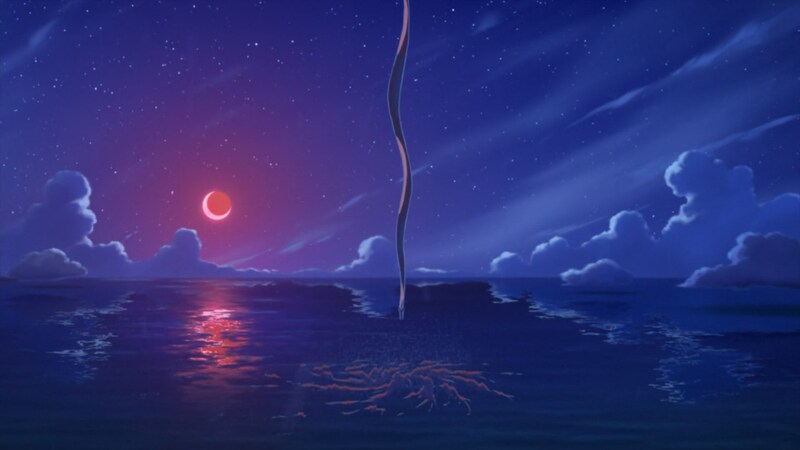 And at the end, the lifeless remnants of an all too powerful being resting in the sea. 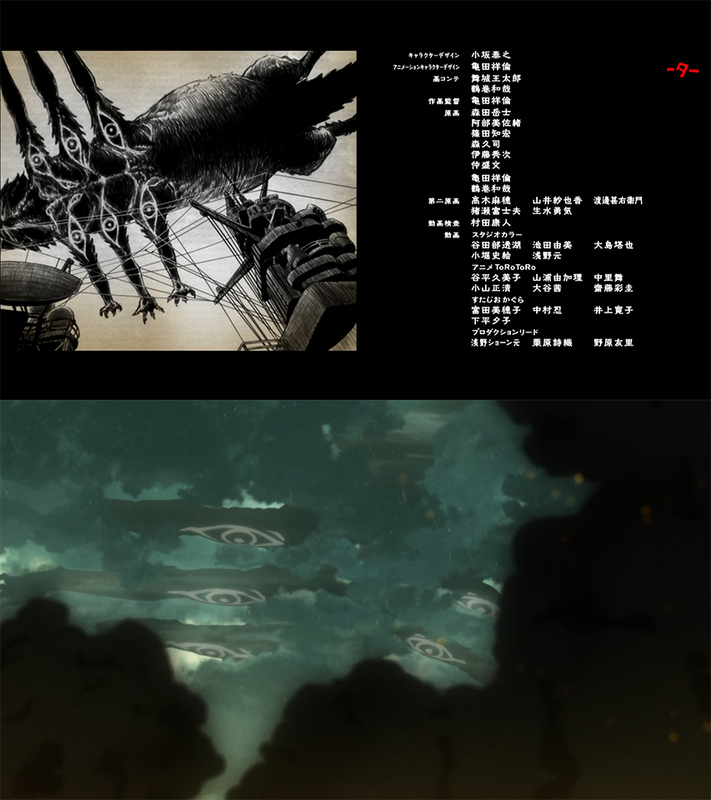 The parallels – particularly with End of Evangelion – go beyond merely coincidental as The Dragon Dentist approaches it climax. Tsurumaki was rather fed up with Eva 20 years ago already, and even considered EoE a frankly unnecessary addition to the series. During the early 00s he managed to leave his personal imprint away from the series as Anno distanced himself from Gainax, but ever since Khara’s foundation he’s spent years working on even more Evangelion. Directing, storyboarding, writing, designing and animating for a series he was done with ages ago. It should honestly be no surprise that this unhealthy relationship with his own work has had an effect on his output. The Dragon Dentist presents you with warriors fully aware of the circumstances of demise that awaits them. In its world, to fight back against that fate is to be brave, but also leads to an even earlier end. And where does that leave Tsurumaki? In spite of his beliefs, he can’t seem to escape Hideaki Anno’s shadow, let alone his own. There are clear thematic paths he keeps retracing, to the point that the feeling of adolescence in I Can Friday by Day (2015) is remarkably familiar to the one that defined FLCL (2000). 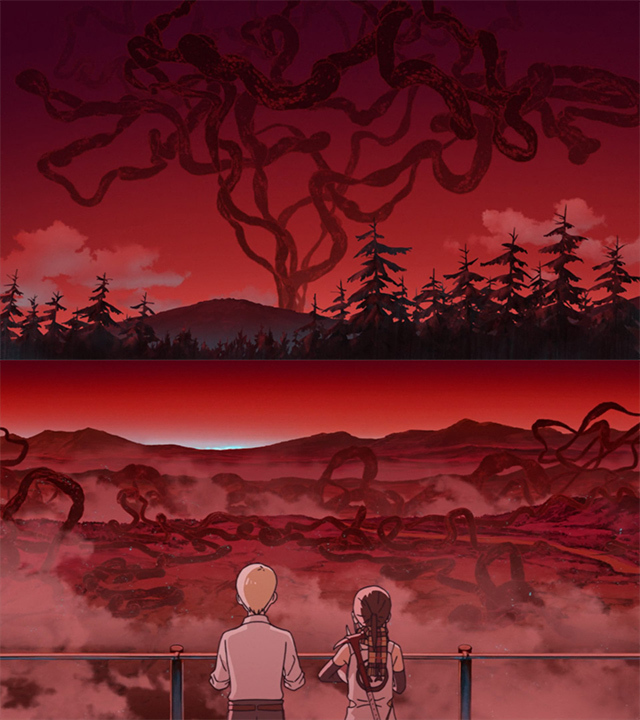 The Dragon Dentist is far from the only major modern Tsurumaki work with shades of Evangelion; he obviously followed the rest of the crew to storyboard Shin Godzilla, and calling that film reminiscent of the series would be the understatement of the century. And more precisely, his involvement with the actual landmark titles of his career never seems to come to an end. It’s not just Eva anymore, as he’s also been tasked with supervising the upcoming FLCL sequels. Has he given up, then? That’s not the feeling I get. The Dragon Dentist depicts their clash of ideas, but ultimately treats those who have proudly accepted their destiny with the same respect as the brave yet perhaps foolish ones who reject it. Tsurumaki is chained to his past works, but he still strives to create something new like he has always vocally defended. Rather than butting heads with fate and rejecting his legacy, he’s embraced it and made it part of his toolset to pursue his dream of chasing new ideas. 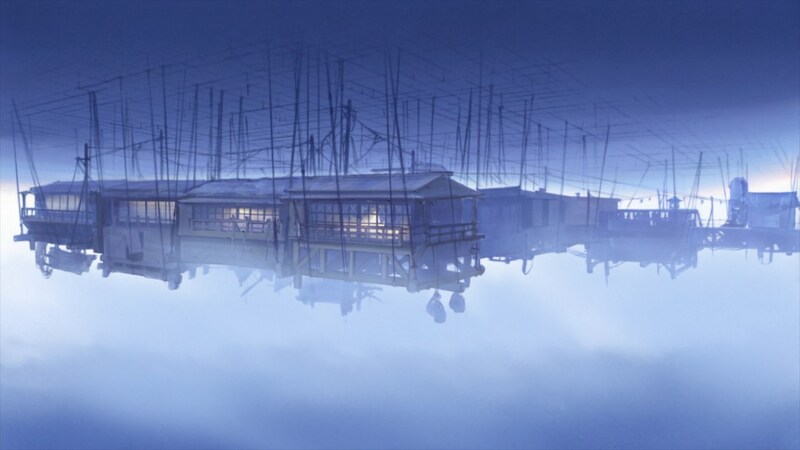 Here’s to more, perhaps flawed but always fascinating, Tsurumaki work. Support us on Patreon for more analysis, translations, staff insight and industry news, and so that we can keep affording the increasing costs of this adventure. Thanks to everyone who’s allowed us to keep on expanding the site’s scope! 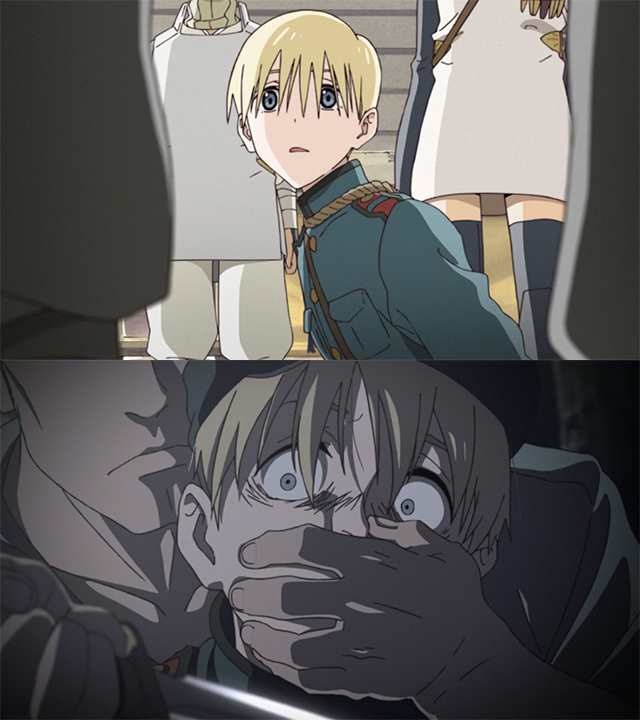 I was joking about the moe menace ruining cartoons when I showed the comparison footage to some people too! Nonoko is way more expressive in this iteration…though that not really due to the designs I feel, they just put them in the hands of exceptional animators. Either way I think they both have their appeal, but Kameda is clearly the better animation director. And yeah, The Dragon Dentist is grand in the way Gainax’s work used to be. Khara’s state is honestly ridiculous, they’ve got multiple directors who can pull this off with ease and yet their output is incredibly limited.